The Nazi Regime’s mandate was based on their supposed ability to make Germany into a world power once again. Their entire ethos was devoted to the ideals of German superiority, and Hitler set out to prove that perceived superiority as best he could. The 1936 Olympics, held in Berlin, were a great success for Nazi Germany; it showcased the nation’s economic recovery, and the German team won more golds than any other. This was a great propaganda victory for the Nazis, but they weren’t finished yet. Among many other endeavors, the Nazis set out to smash the land-speed record, which they did. When they set the new record they believed it would help them accomplish two goals, it supposedly proved that they, the Nazis were “better”, and it showcased their incredible new Autobahn. The Autobahn system that linked Germany was an object of pride for the racist regime. Ironically, the Autobahn method of highways that linked Germany was initially rejected by the Nazis. Planned by the former Weimar government, the Nazis declined them, only to embrace the thought of a national road once they got into their power. They were hypocrites like that. The automotive history is filled with hypocrites creating fascinating cars (Henry Ford and Ferdinand Porsche). Several of those fascinating cars happen to be the low to the ground, sleek streamliners, specifically created to break records. These records still stand to this day. Even with the records, we should always remember that the sleek speed machines were a product of immense evil propaganda, and the drivers were consenting participants. The Germans had mastery over the Grand Prix racing in the 1930s, with auto creators like Mercedes-Benz, and the Auto Union pushing out the Silver Arrows. The Mercedes-Benz W125 Rekordwagen, was the main car of the Grand Prix racer. It was a successful car, winning six of the 12 races it participated in. 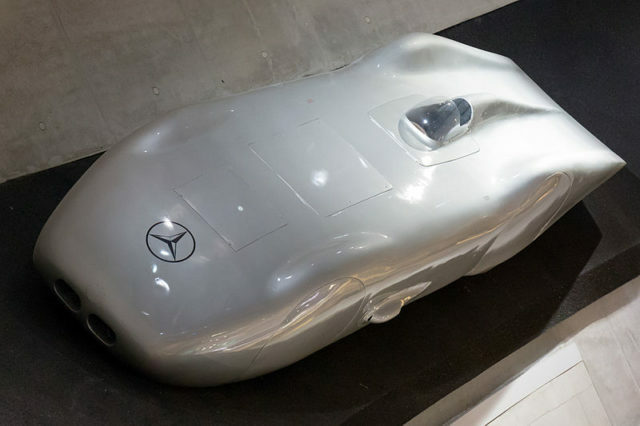 The W125 was highly modified for its record run in the year of 1937, getting rid of the open wheel layout of the track racing, and swapping it out for some sculpted body work. The primary inline eight cylinder engine, for the 736 horsepower V12 that could be placed in the lower section of the car was abandoned. All adjustments were created for top velocity, from the new housing for the lateral mounted exhaust to the small inlets in the front for the air intake. The radiator, which usually receives air from the outside to assist with the cooling, did not have an air intake. As an alternative, the car used a chest filled with ice. One thing that was not altered within the car was the driver, Rudolf Caracciola. He had driven the primary W125, so it was not a big change for him. Most German racing drivers of his time were members of the NSKK. The NSKK was a Nazi organization dedicated to cars. He worked his way up in the world not only because of his superior skill behind the wheel, but as also through a chance meeting with Adolf Hitler. Hitler ordered a Mercedes Benz 770 in the year of 1931, which was the car you would always see Nazis being transported in. Caracciola, Mercedes’ top-quality driver, was requested to do the delivery, and drive Hitler and his niece around town. Hitler had taken a liking to him as Caracciola’s career progressed, but Caracciola alleged that the fascist nut did not impress him much. That did not stop him from giving public support for the Nazis later on, but after the war he claimed did not really support the Nazi party. On the date of January 28th, 1938, Caracciola positioned his W125 Rekordwagen on Bundesautobahn 5, and commenced his run. He eventually reached the incredible speed of 268 miles per hour for the flying kilometer. This remains to this day the speed record for a public road.